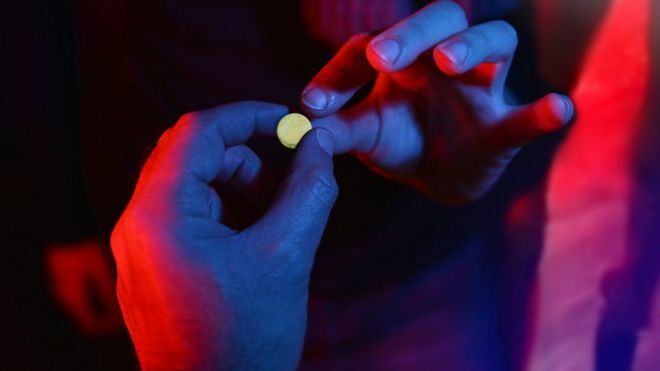 Seven people have been hospitalised after taking a “particularly potent” form of the drug MDMA, police said. Four men became seriously ill on Saturday, with two still in intensive care. A woman and two men were hospitalised on Sunday, with one man seriously ill and the other two critical. Greater Manchester Police said the drugs are known locally as “magic” or “pink champagne” and come in crystal form. A 26-year-old man has been arrested on suspicion of supplying Class A drugs and remains in custody for questioning. Det Insp Jim Faulkner of GMP’s Oldham Borough said the increasing number of people affected is causing the force “no end of concern”. He said symptoms to watch for include rigid muscles, shallow breathing, a fast racing pulse, hyper-aggression, seizure, foaming at the mouth and unconsciousness. “Please, if you believe that you or somebody you know has taken the drug and begins showing these symptoms then get yourselves to the hospital immediately,” he added. Of the men hospitalised on Saturday, two have been released.